Thanks Shahidah & Syazwan for giving the most comfort trust throughout the whole renovation, i hereby attached 3D and actual do up for eveyone to see result. After searching for so many id,I finally decided to engage Ronald from designer house. Thanks to Home owner Zhen Wei to let us involved in your interesting Halloween design, hope to see your finished product soon! Ronald is a gem to work with, professional and responsive. Did a great job to our small project! Thank you. Thanks Jaslyn for being helpful & easy during the reno process! 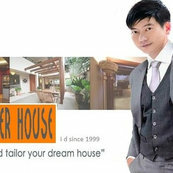 I have engaged Designer House's Ronald for my new condo unit. Thanks venzo1870 for always be there for me, this is the second house that he entrusted to me, since when i was still inexperienced.